Bienvenido a la tierra de Nomad. Este espectacular apartamento está situado cerca de playas, ruinas mayas y ciudad de Tulum. El complejo Zama Village es los condominios más cercanos a la playa ya la primera que se construirá en el nuevo proyecto Aldea Zama. Hay una nueva tienda de abarrotes llamada Chedraui derecha por la calle para todas sus necesidades de vacaciones. Además, una estación de servicio de Pemex, alquiler de bicicletas, servicios médicos, bancos y restaurantes están muy cerca. El condominio está ubicado en el segundo piso de este complejo de bajo aumento de 3 niveles y está rodeado de selva. En realidad, da a una hermosa piscina con plantas tropicales de todo. El condominio cuenta con 2 dormitorios, 2 baños completos, bañera de hidromasaje, una cocina completa, sala de estar abierta, aire acondicionado, ventiladores de techo, y 3 balcones. Usted podrá disfrutar de todos los muebles de bambú de alta calidad. Realmente te da la sensación de estar en el trópico. El dormitorio principal consta de una cama king size, su propio baño de tamaño completo, un balcón privado con bañera de hidromasaje y vistas a la selva. Déjame que te cuente, margaritas van bien en la bañera de hidromasaje. También, un Samsung 40 "LED televisor de pantalla plana está montado en la pared para su disfrute. La habitación tiene cómodas camas individuales, un baño de tamaño completo, un "LED TV de pantalla plana de 32, y un balcón privado, que también tiene vistas a la selva. Tal vez verás una Tucan o tal vez un mono araña! La cocina cuenta con electrodomésticos de acero inoxidable, encimeras de granito, una mesa para 6 huéspedes, y todas las necesidades de su cocina. Está abierto a una bonita habitación de tamaño de estar, que cuenta con un sofá, sofá de dos plazas, mesa de café, mesa final y en un 43 "Samsung TV de plasma que está montado en la pared. La mejor parte es caminar fuera de la sala de estar a un gran balcón que se encuentra sobre una piscina en forma de río lento. No hay nada mejor que tener su primera taza de café en él y disfrutar de las tranquilas vistas de la mañana. ¡Asi que! Si lo que buscas es ir de fiesta, visitar lugares históricos, disfrutar de deportes acuáticos o simplemente relajarse. Ven al paraíso! Ven a la tierra de Nomad! Very good place at Tulum. Quiet, spacious, good equipped. We have no see toucan and monkey, but we have seen coati all the morning. Thank you for the wonderful review. Happy to hear you guys really enjoyed your vacation and stay at Nomads Land. Hope to have you back again. We spent Thanksgiving week at Nomad’s Land in Tulum. Everything about the condo was terrific. Location was great, it was clean and comfortable. We spent the week visiting ruins, beaches and cenotes, all conveniently close by. Everything worked well, we had no problems whatsoever. Cathy was super helpful getting us oriented. We loved being there and hope to get back again really soon. We highly recommend this unit for couples, as well as small families. We are so happy that you and boys had a terrific Thanksgiving vacation. We really appreciate the 5 Star review. Hope to see you guys again. You are greeted upon entry into the complex by a lovey winding serene pool and setting. The condo is nicely appointed with furniture, and a very comfortable king bed and sheets. The floors were exceptionally clean, welcoming bare feet, but housekeeping could use more supervision (ie, trash not emptied in kitchen with no liners in can). I would suggest more cleaning detail to the sinks - both kitchen and bath- (perhaps a stronger cleaning solvent would tackle the water deposits and shine the stainless a bit). The showers need attention in the corners for a more pleasant bathing experience. This condo is conveniently located within the beach/town area. We recommend renting a car and forgo the temptation to rent bicycles for your transportation, as we just rented bikes. The biking is very challenging with traffic and narrow bike paths being used in both directions. There's a large supermarket near by and a small convenience store in the complex. 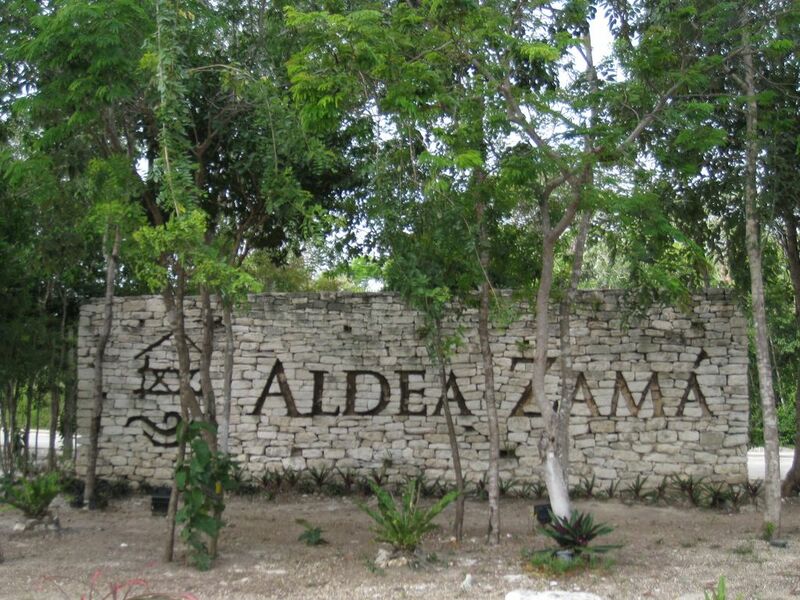 This will be a premiere location eventually, especially as Aldea Zama continues to develop this community. There's a lot of construction going on there, and walking at night is difficult because many of the street lights are not functioning yet and there are squatters in the buildings being constructed. A cab ride into town or to the beach is about 5 USD +/-. Thank you for your comments. We are super disappointed with a 3 star review, as you can see it's our first. The oversight of cleaning staff forgetting to take out the garbage is embarrassing, but was quickly fixed. Calcium stains are quite common with our water supply and is not something that can be "cleaned" off .We are sorry that you felt that this was a cleanliness issue and certainly regret that something such as this would result in a 3 star review. Meanwhile we will look into changing fixtures to avoid misperceived complaints in the future. The unit was in a great location, convenient to the pueblo and beaches! It was very well equipped and we enjoyed our meals on the balcony over the pool. The beds and linens were very comfortable. We would recommend to others and will return the next time we are in Tulum! Thanks for sharing your lovely Mexican vacation home! Thank you for your wonderful review. We loved having you as our guest. Its people like you that make it worth sharing our place in Paradise. The apartment was clean, the master bed was comfortable. It's in a well maintained, quiet, safe complex on a street with lots of new development. The manager (Cathy) were very responsive to text messages. It's about a 10 min bike ride (on a separated bike path!) from both town and the beach. 5-6 minute ride to big grocery store. Lots of taxi access, they pass on the street every few minutes. The dish TV service was out so I missed some morning World Cup games but this is apparently a problem with the entire area, not just this unit. Only other (minor) issue was inoperative microwave (at least I couldn't figure it out). I'd stay here again. Cathy and I are glad that you enjoyed your stay. We were very pleased hosting you guys. Cheers! Excellent attention to detail and very quick response from owner. Cathy and I thank you so much for your nice review. We hope you guys will visit again. People like you are always a pleasure to host. Zama Village se encuentra a minutos de distancia del mar Caribe, ruinas mayas, y la ciudad. Hay una gran tienda de abarrotes, tiendas de surf, alquiler de bicicletas, etc. muy cerca. También puede visitar los parques temáticos y acuáticos como Xcaret, Xel-ha, y Xplor encuentran muy cerca. * Check in 3pm Check out 10am * Discount for stays over 10 nights- $100.00 USD per night, after the 10th night. Excludes Holiday Season * VRBO secured online payment: MasterCard, Visa, Discover, etc. * Bank Transfers * Cancellation Policy: 100% refund if cancelled at least 30 days prior to arrival, otherwise there is a $200 cancellation fee.